There are a few ways to take your taco Tuesday to the next level and it starts with the basics: ditch the store bought seasoning packet and make your own seasoning mix! It’ll take you around five minutes to make and you probably already have all the ingredients in your kitchen. In every scenario, regardless of what I’m making, I always find the homemade alternatives of store bought convenience items to be SO much better! The flavor is better and you actually know and can easily pronounce every ingredient. Have y’all read the ingredient list on the packets of yummy Ortega or Old El Paso taco seasoning? I can promise you we don’t have any maltodextrin, yellow corn flour, silicon dioxide or hydrogenated soybean oil in this recipe! Another ingredient listed on these packets simply says ‘spices’. I would imagine this can’t be too bad, but strange isn’t it? Why aren’t the actual spices just included? It’s nonsense that doesn’t need to be part of taco night! We have two steps in this lengthy process. Step One: Add all spices (chili powder, garlic powder, onion powder, red pepper flakes, oregano, paprika, cumin, salt and pepper) to a small mixing bowl and stir to combine. Step Two: Pour seasoning into an airtight container for storage. These glass terrines – The smallest one is pictured above and currently storing my taco seasoning in our kitchen! Similarly, weck canning jars – Don’t actually use these for canning 🙂 I usually have one of these filled with candies or mixed nuts on our counter! Pop Canisters – My absolute favorites! I have a handful of these and use them for cereal, chips, pretzels, pasta and even for the pet’s food! Love, love, love! Drawer Spice Rack – I had to pack this away for now since our apartment kitchen doesn’t have room for it, but this simple product made me so happy as a person who adores organization! My spice bottles were constantly cluttered in the cabinet before this came home with me and saved the day! Glass Tupperware – I prefer glass over plastic and have several of these containers to use any time we have leftovers to store in the fridge! Stay tuned for part two of taking taco Tuesday to the next level; it’s all about homemade fresh tomato salsa and the recipe is from my new favorite cookbook – Magnolia Table! Such a good read in addition to the wonderful recipes…if you’re thinking about buying it I definitely recommend it! 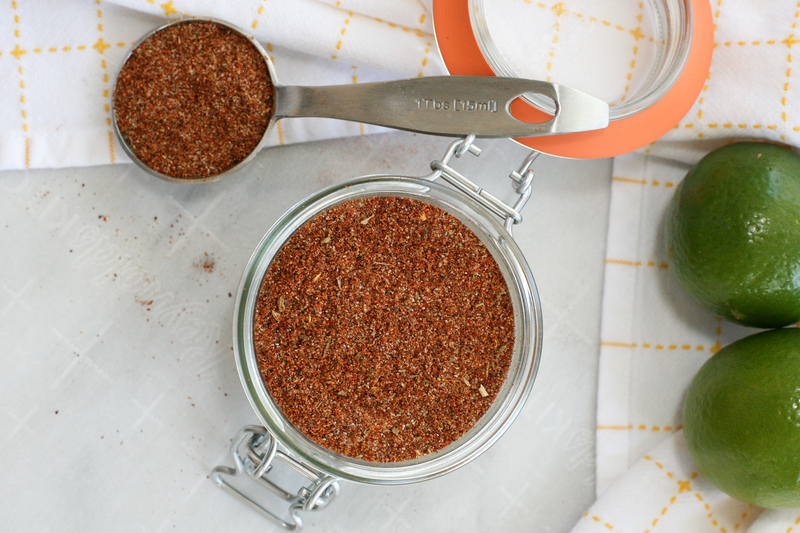 Simple Seasoning for beef or chicken tacos! Add all ingredients to a small mixing bowl and stir to combine. Pour into an airtight container and keep in cool, dry pantry for 1-2 months. You can use this seasoning just like you use the store bought packets. About two tablespoons of homemade seasoning equals one packet. This entry was posted in Homemade Alternatives, Recipe Book and tagged healthy tacos, homemade alternatives, homemade taco seasoning, mexican food, simple recipes, taco mix, taco seasoning, taco seasoning recipe. Bookmark the permalink.